Wednesday, August 21st - When Willie Mays first arrived in the major leagues he proceeded to get only one hit in his first 25 at bats. However, he rebounded to win the National League’s Rookie of the Year Award and went on to have a pretty fair career, as the statue of him outside AT&T Park in San Francisco and his place in the Baseball Hall of Fame attest. The moral of the story? Keep battling back and good things can happen. The California Self Storage Association (CSSA) is reacting exactly the same way to it’s recent setback in the California Senate Judiciary Committee to a bill intended to help self storage operators dealing with lien laws. Bill AB 983 had moved quickly through three prior committee votes and seemed destined to keep moving until it was stopped cold by the Senate Judiciary Committee. The CSSA has pinpointed the area that likely caused the bill’s downfall and is now proceeding with a new version it hopes will make it all the way through the California legislature. The efforts of the national SSA to help the CSSA get this legislation passed have been strong and ongoing. The SSA has been providing financial support to the effort and SSA Sr. VP of Communications and Government Relations Tim Dietz has been extremely helpful in strategizing with CSSA lobbyist Randy Pollack and suggesting positive ways in which the CSSA can move forward. But the legislative effort also needs the support of CSSA members. The CSSA is still accepting legislative donations and those donations are extremely important. Founded in 2002, the California Self Storage Association (CSSA) is the state not-for-profit trade organization dedicated to serving the California Self-Storage industry including owner-operators, facility managers and industry vendors. The CSSA represents some 450 direct member companies that own and operate over 1,200 facilities in California. CSSA direct members range from individual facility owner-operators to multiple-facility operations, to the industry's largest publicly traded Real Estate Investment Trusts (REITs). (August 9, 2013 – Temple, GA) – Janus International Corporation has announced the acquisition of the web-based ADA compliance kit entity StorageDisabilityProducts.com. Janus President David Curtis sites the natural pairing of ADA kits and Janus’ door and hallways solutions as the force behind this acquisition. "Acquiring StorageDisabilityProducts.com allows us to illustrate our commitment to the self-storage industry becoming ADA compliant in an easy, accessible manner,” says Curtis. StorageDisabilityProducts.com offers both indoor and outdoor ADA kits, containing signage, pulls and ramps for designated ADA storage units. StorageDisabilityProducts.com will operate out of Janus’ headquarters in Temple, Georgia. Janus International is a leading manufacturer of steel roll up doors and hallway systems for the self-storage industry. For more information, visit our websites at www.janusintl.com or www.storagedisabilityproducts.com. July 29, 2013: Bancap Self Storage Group, Inc., the "#1 Self Storage Broker in California,” announced that it has successfully brokered the sale of the AAA Stor-Stuff Self Storage property located in the city of Lancaster in Los Angeles County, California. Dean Keller, the firm’s president, was the exclusive listing agent for the property. The seller was a private investment firm that had purchased the mortgage on the property from a special servicing firm after they had begun the foreclosure process. After the foreclosure of the property was completed, the group elected to list the property for sale. The buyer is a private limited liability company owned by local investors who are new to the self storage industry. AAA Stor-Stuff Self Storage was built in1986 and is a well-designed single story facility with all drive-up units. The building walls, roofs, partitions and doors are all metal construction. Located on 4.2 acres of land, the property contains over 61,600 net feet of self storage space divided into approximately 520 units. There are also 39 uncovered vehicle storage spaces for RVs, boats and automobiles. The property sold for $2.6 million (approximately $42 per net square foot) on a "cash to new loan” basis. Occupancy at the facility was about 65% and climbing. "This was a rare opportunity to purchase a temporarily underperforming self storage property in Los Angeles County with significant upside potential,” said Keller. Friday, July 26th - In spite of the recent disappointing turnaround for the AB 983 bill in Sacramento, the CSSA has continued to fight the good fight to bring about the kind of legislation that will benefit state self storage facilities. Finding ways to improve the lien laws will be an ongoing movement and that quest will be greatly aided by the assistance provided by the national Self Storage Association (SSA). Thanks to the guidance of Tim Dietz, the SSA’s Sr. VP – Communications and Government Relations, and Carlos Kaslow, the SSA’s General Council, improving life for the California self storage owner/operator is a focal point. Of course, the SSA is doing the same for states across the country, but it has donated a significant amount of funding to California legislation over the years. In fact, in 2010 a successful lien update took place in the California legislature which rounded out an already improved law. It took a joint effort from the CSSA and SSA to make it happen and the two forces will continue to concentrate on making good things happen despite the recent setback. "Often these efforts take 2 or 3 years to complete successfully, particularly in larger states with so much activity at the capitols," said Dietz. "The SSA/CSSA enjoyed a successful collaborative effort to improve the lien law a few years ago, an effort which took a couple of sessions to complete. Although the votes didn't go our way in one committee this time, much progress was made and we look forward to working at it until this burdensome law is amended." The SSA has worked on 16 lien bills this year across the country and eight have been successful so far. CORAL SPRINGS, FLORIDA—July 29, 2013—Better Management Systems (BMS) President David Blum is pleased to announce Expo 13, the 1st trades and educational gathering for Latin America. The event will take place November 4-5, 2013, in Sao Paulo, Brazil, at the modern convention center located at the headquarters of Secovi-SP (the Sao Paulo State Housing Syndicate). Expo 13 will feature top experts in the self-storage industry including keynote speaker Patrick Reilly, Chairman of the Board of the Self Storage Association (SSA), the national non-profit organization that oversees the industry in the U.S. Reilly also is the President and CEO of Urban Self Storage of Seattle, Washington. The trade show will include exhibits by vendors that are involved in all aspects of the self-storage business such as security, building, insurance, and marketing. Expo 13’s key vendor sponsors are Janus International, PTI Security Systems, Chateau Products, and SiteLink Software. For more information about attending or exhibiting at Expo 13, please visit the event website at www.ssabrazil.com or email braziltradeshow@gmail.com. Better Management Systems (BMS), founded by David Blum, first began working on international projects in Sao Paulo, Brazil in 2004 at the request of a U.S.-based client. BMS was given the opportunity to convert an existing structure and integrate all the latest technology and products from the U.S. thereby bringing American style self-storage to the country and adapt it to the local Brazilian culture. As Past President and Co-founder of the Florida Self Storage Association, Blum has more than 10 years of experience in assisting with the production of trade shows. The Latin American Self-Storage Association (LASSA) is the trade association for the self-storage industry in Latin America. Its objectives are to support its members as suppliers or users, spread the benefits of self-storage, and promote best practices within the industry. LASSA welcomes all those owners, managers, vendors, companies, and investors in the guidelines of the self-storage business that would like to join the association. For more information, visit www.laselfstorage.org. The Sao Paulo State Housing Syndicate (Secovi-SP) has been in existence since 1946 and is recognized as the home to the Brazilian real estate industry. The Syndicate houses several key operating sectors of the real estate production and service chain in Brazil. July 25, 2013 - The old expression "you never know” was never more dead-on than when the California Senate Judiciary Committee gave a major thumbs-down to a bill intended to help self storage operators dealing with lien laws. Bill AB 983 had moved quickly through three prior committee votes and there seemed to be no reason to think it wouldn’t make it through the Senate Judiciary Committee. But on July 2, thanks to a strong opposition from Senate majority leader Ellen M. Corbett, the bill was grounded in its tracks. According to legal expert Carlos Kaslow, the primary obstacle to the bill’s passage was a change that it made to the court procedure to be followed after a Declaration in Opposition to Lien Sale was returned by a delinquent occupant. Under current law the storage operator is required to bring suit in small claims court when a Declaration is returned. AB 983 would have required the occupant who sends back a Declaration to file the lawsuit on the validity of the lien within 30 days of returning the Declaration. Storage operators have been dissatisfied with the current procedure because a high proportion of delinquent occupants who returned Declarations never showed up for the requested hearing. It was hoped that delinquent occupants would only return a Declaration when they had legally relevant reasons for executing the form and would be more likely to appear at the hearing if the occupant initiated the suit. The Judiciary Committee action was somewhat surprising and disappointing because the bill had passed the Assembly by an overwhelming majority and had also passed the Senate Business, Professions and Economic Development Committee without opposition. There were Senators on the Judiciary Committee who opposed the bill who had previously voted for it when it came before the Business, Professions and Economic Development Committee. CSSA lobbyist Randy Pollack also was miffed by the Senate Judiciary Committee’s decision. "Also, at this point we learned that Senator Corbett (no longer Chair of the Judiciary Committee but who remains a member) had second thoughts about her vote in the Senate Business & Professions Committee, reversed course and began to lobby members of the Committee to oppose the bill,” added Pollack. So where does the CSSA and national SSA go from here? June 11th 2013 - It is always better to think ahead than to wait for trouble to come knocking on your door. The CSSA is acutely aware that its members need to be informed and ready for any and all changes taking place in the industry. The latest involved accessibility inspections and your rental agreements. Does your facility provide proper access to those with disabilities? Has your facility been inspected by a Certified Access Specialist (CASp) and been determined to meet all applicable construction-related accessibility standards set up in Civil Code 55.53? Regardless of your answer to those questions, starting on July 1 you will want to have it written into your rental agreements if you want to avoid future ADA (Americans with Disabilities Act) legal entanglements. "A commercial property owner or lessor shall state on every lease form or rental agreement executed on or after July 1, 2013, whether the property being leased or rented has undergone inspection by a Certified Access Specialist (CASp), and, if so, whether the property has or has not been determined to meet all applicable construction-related accessibility standards pursuant to Section 55.53." The law does not specify the form or placement of this disclosure, but it does require that it be in the rental agreement. Facilities that have been inspected and state that is has been inspected by a certified inspector and is in compliance with state and federal accessibility standards will be less inviting targets to the ADA lawsuit industry." Here is the good news – the CSSA sells a rental agreement template that Kaslow has already updated to include the above requirement. In fact, the CSSA’s rental agreement template (which can be purchased for a one-time fee of $349) is constantly being updated and sent to members who have purchased it. As Kaslow and King have made clear, the ability to avoid future ADA lawsuits can hinge on whether you have the proper wording in your rental agreements. And while it makes sense to have a Certified Access Specialist inspect your property, even if you haven’t been inspected you need mention of that in your rental agreement. For more information about the CSSA and its products, please visit www.californiaselfstorage.org. On The Move is thrilled to add an innovative food truck to their product line. On The Move has been in the specialty truck leasing business for over 20 years. Their food truck design is unique and provides the operator the ability to serve upwards of 1000 people per day. It would be a perfect offering to do demographic studies on proposed restaurant locations prior to building out an entire store, attend special events and as a promotional tool to market brand recognition. A slide out is part of their unique design that allows the servers to be at face level with their customers unlike anything in the industry. Additionally, the slide out provides more work space for the servers and cooks. On The Move customizes the interior with the kitchen equipment needed to prepare and serve the restaurant’s menu items. Additionally, it has a built-in generator, water holding tanks (both fresh and grey) as well as an optional soda dispenser and serving counter on the outside of the truck. On The Move Food Trucks made their debut at the National Restaurant Association in May and had a surplus of positive reviews and orders! Look for an On The Move Food Truck at a food truck park near you! For more information, visit www.onthemovetrucks.com. NEWPORT BEACH, CALIFORNIA — May 31, 2013 — If you want to put on a successful gathering for self storage owner/operators, you might want to do it the way the California Self Storage Association did in early May. First, find a compelling location – Napa Valley is about as good as it gets. Second, have a strong program. Third, make it fun – a bocce ball tournament to raise money for Kure It Cancer Research is a great way to go. So it was from May 1-3 that the CSSA hosted the 2013 West Coast Self Storage Owners Conference at the Westin Verasa in Napa California. The event was a sellout, with 200 people attending the three-day event (75 per cent of which were owners). The keynote speaker was Hugh Horne, president and CEO of Horne Developments, Inc. Topics of the conference included: transitioning your family business from one generation to the next, Affordable Care Act information, post consumer mindsets and employment law updates. Karen Jones, the director of Kure It Cancer Research was equally thrilled with the gathering. "We are grateful to the CSSA and its members for their enthusiastic participation in the first ever Bocce for a Kure tournament,” Jones said. "Everyone from the bocce players to the event sponsors contributed to make it a fun networking opportunity that raised over $5,000 for underfunded cancer research. In fact, the post-conference survey of individuals who attended included quotes like "great hotel & reception area, excellent location and well organized -- great for networking” from one attendee and "First-class event, wonderful job, Erin! Would like to see it back in Napa again next year” from another. The survey also indicated that future CSSA gatherings should focus even more on owners with 10 or less facilities. King was pleased with the way the event went, especially considering that it was a chance for Northern Californians to gather for a few days of networking, learning and having fun. For more information about the CSSA and its efforts, please visit www.californiaselfstorage.org. 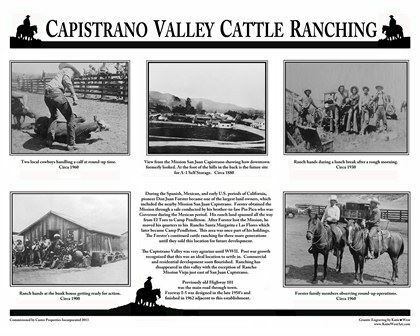 A-1 Self Storage San Juan Capistrano to Feature Historical Plaque to Honor the Site’s Cattle Ranching History and Land Baron, Don Juan Forster. Source: "New San Juan storage center will honor site's history.” Orange County Register; 26 March 2013. A-1 Self Storage is one of the leading providers of self storage units in California with 8 locations in Orange County and 42 locations statewide. A-1 is the Self Storage division of the Caster Companies, a third generation family-owned company headquartered in Southern California since 1959. The Caster Companies specializes in acquisitions, development and management of A-1 Self Storage. Its Real Estate Portfolio includes over 4 million square feet in real estate properties. It is one of California’s largest independent self storage and car storage owner/operators in California.